Portable Travel Cot - All-in-one - Carry Bag: REDUCED! The all in one Portable Travel Cot is a light weight design made specifically for travelling. It is very well equipped with a rocker function, removeable bassinet change station and handy storage basket. 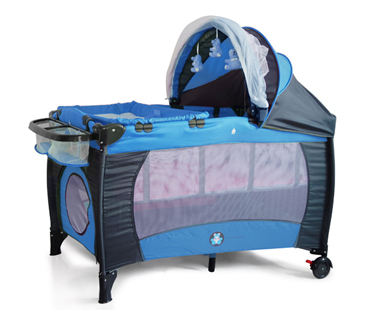 You have the convenience of a Portable Cot and Playpen in one with enough space for your child to play in. This Portable Travel Cot has been independantly tested and meets Australian safety standards, it is quick and easy to setup for use. The handy carry bag with two shoulder straps makes it easy to transport and store. We also two great Wooden Sleigh Cots available in White and Espresso. Rocker function, removable bassinet and travel cot all in one. Handy Carry Bag with two shoulder straps -for easy transporting and storing. Dual lockable wheels-easy to brake. Enough space for your child to play in. Removable Changing station, shaded canopy , toy mobile and mosquito net and storage basket and a very nice and convenient BAG. This Cot is covered by a 3 months manufacturers warranty, against manufacturing defects. Cot for sleeping baby or toddler. Playpen for baby or toddler. Please specify your phone number for delivery purposes. Please Note: We do not ship overseas or to PO boxes for this product, so please specify a suitable address, and include any specific delivery instructions (such as leave at back door/side gate etc), to avoid any re-delivery fees.